Through creating these beautiful hand crafted furnishings, we can help you create your dream environment, as well as make it possible to pass to your heirs cherished family heirlooms and a little immortality. We believe all of our customers are intellectually sophisticated and understand the real value of creating and appreciating these family heirlooms. We understand how difficult it is in today's marketplace to determine the genuine article from the fake or faux. For this reason, we believe when presented with the true facts of how each product is made and the materials it is manufactured from, our customers have the ability to make informed decisions that are best for them and their financial investment based upon these facts. When you purchase a quality, hand built, family heirloom/future antiquity you are investing, not wasting your money on a fake future yard sale item. We believe you will also conclude from this information, as we have experienced over our many years, only by using the best natural materials and master handcrafting, can you achieve the creation of a family heirloom, investment quality furnishing or door. The use of true solid timber, genuine stones, top grain leathers, fine fabrics, and solid wrought iron in the hands of master craftsmen will never be replaced with modern methods of mass production. Leather is a material created through the tanning of hides and skins of animals, primarily cattle-hide. The tanning process converts the putrescible skin into a durable, long-lasting and versatile natural material for various uses. Together with wood, leather formed the basis of much ancient technology. The leather industry and the fur industry are distinct industries that are differentiated by the importance of their raw materials. In the leather industry the raw materials are by-products of the meat industry, with the meat having higher value than the skin. Tanned using tannin and other ingredients found in vegetable matter, tree bark, and other such sources. It is supple and brown in color, with the exact shade depending on the mix of chemicals and the color of the skin. It is the only form of leather suitable for use in leather carving or stamping. Vegetable-tanned leather is not stable in water; it tends to discolor, and if left to soak and then dry, it will shrink and become less supple and harder. In hot water, it will shrink drastically and partly gelatinize, becoming rigid and eventually brittle. Boiled leather is an example of this where the leather has been hardened by being immersed in hot water, or in boiled wax or similar substances. Historically, it was occasionally used as armor after hardening, and it has also been used for book binding. Invented in 1858, is tanned using chromium sulfate and other salts of chromium. It is more supple and pliable than vegetable-tanned leather, and does not discolor or lose shape as drastically in water as vegetable-tanned. It is also known as wet-blue for its color derived from the chromium. More esoteric colors are possible using chrome tanning. Tanned using glutaraldehyde or oxazolidine compounds. This is the leather that most tanners refer to as wet-white leather due to its pale cream or white color. It is the main type of "chrome-free" leather, often seen in shoes for infants, and automobiles. Formaldehyde tanning (being phased out due to its danger to workers and the sensitivity of many people to formaldehyde) is another method of aldehyde tanning. This type of leather falls into the category of aldehyde tanning and is exceptionally water absorbent. Brain tanned leathers are made by a labor-intensive process which uses emulsified oils, often those of animal brains. They are known for their exceptional softness and their ability to be washed. Chamois leather also falls into the category of aldehyde tanning and, like brain tanning, produces a highly water absorbent leather. Chamois leather is made by using oils (traditionally cod oil) that oxidize easily to produce the aldehydes that tan the leather to make the fabric the color it is. Tanned using aromatic polymers such as the Novolac or Neradol types. This leather is white in color and was invented when vegetable tannins were in short supply, i.e. during the Second World War. Melamine and other amino-functional resins fall into this category as well and they provide the filling that modern leathers often require. Urea-formaldehyde resins were also used in this tanning method until dissatisfaction about the formation of free formaldehyde was realized. Tanned using aluminum salts mixed with a variety of binders and protein sources, such as flour, egg yolk, etc. Purists argue that alum-tanned leather is technically "tawed" and not tanned, as the resulting material will rot in water. Very light shades of leather are possible using this process, but the resulting material is not as supple as vegetable-tanned leather. Made by scraping the skin thin, soaking it in lime, and then stretching it while it dries. 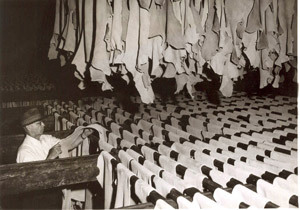 Like alum-tanning, rawhide is not technically "leather", but is usually lumped in with the other forms. Rawhide is stiffer and more brittle than other forms of leather, and is primarily found in uses such as drum heads where it does not need to flex significantly; it is also cut up into cords for use in lacing or stitching, or for making many varieties of dog chews. This supplements the natural oils remaining in the leather itself, which can be washed out through repeated exposure to water. Frequent oiling of leather, with mink oil, neatsfoot oil or a similar solution, keeps it supple and improves its lifespan dramatically. Full-grain or epidermis leather refers to the upper section of a hide that previously contained the epidermis and hair.The hair and the epidermis have been removed from the hide/skin. Full-grain refers to hides that have not been sanded, buffed or snuffed (otherwise known as Corrected) in order to remove imperfections (or natural marks) on the surface of the hide, although is never perfect. The grain remains in its natural state which will allow the best fiber strength, resulting in greater durability. The natural grain also has natural breathability, resulting in greater comfort for clothing. Rather than wearing out, it will develop a natural patina and change in its appearance over time with some cracking and splitting. 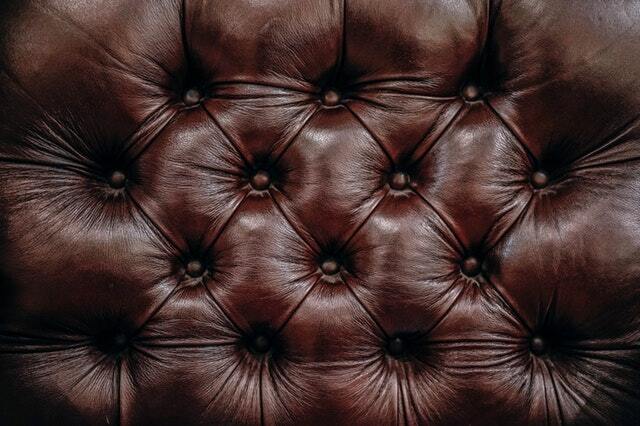 The finest leather furniture and footwear are made from full-grain leather. For these reasons only the best raw hides are used in order to create full-grain or top-grain leather. Full grain leathers can mainly be bought as two finish types: aniline and semi-aniline. Corrected-top grain leather is any leather that has had its surfaces sanded, buffed or snuffed in order to remove any imperfection on the surface due to insect bites, healed scars or brands. Top-grain leather is often wrongly referred to as corrected-grain. Although corrected-grain leather is made from top-grain, as soon as the surface is corrected in any way, the leather is no longer referred to as top-grain leather. The hides used to create corrected leather are hides of inferior quality that do not meet the high standards for use in creating aniline or semi-aniline leather. The imperfections are corrected and an artificial grain applied. Most corrected-grain leather is used to make pigmented leather as the solid pigment helps hide the corrections or imperfections. Corrected grain leathers can mainly be bought as two finish types: semi-aniline and pigmented. Split leather is leather created from the fibrous part of the hide left once the full and top-grain of the rawhide has been separated from the hide. During the splitting operation, the grain and drop split are separated. The drop split can be further split (thickness allowing) into a middle split and a flesh split. In very thick hides, the middle split can be separated into multiple layers until the thickness prevents further splitting. Split leather then has an artificial layer applied to the surface of the split and is embossed with a leather grain (Bycast leather). Many of history's finest handmade designs have been copied by modern mass production manufacturers using cheap third world labor. Most production sofas found in retail stores - no matter the brand name - use substandard materials, such as polished under belly substrate hides or faux man made materials. The unconscionable use of polished under belly substrate hides, or faux man made materials, are being passed off as quality leather in the name of big profits. These big brand name American companies are using just enough sub standard leather to be able to call the material "leather," or a variety of leather sounding names. Most of the non-touchable parts are faux materials such as Nagahide, Pleather ("plastic leather," slang term for synthetic leather), Vegan Leather, Leatherette, Kydex, Birkibuc, Lorica, or Ocean leather. This type of construction will never stand the test of time. The strongest suedes are usually made from grain splits (that have the grain completely removed) or from the flesh split that has been shaved to the correct thickness. Suede is "fuzzy" on both sides. Manufacturers use a variety of techniques to make suede from full-grain. For example, in one operation, leather finish is applied to one side of the suede, which is then pressed through rollers; these flatten and even out one side of the material, giving it the smooth appearance of full-grain. Latigo is one of the trade names for this product. A reversed suede is a grained leather that has been designed into the leather article with the grain facing away from the visible surface. It is not a true form of suede or leather and will not wear well or last over time. Most production sofas will break down if you sit in the same spot over and over. The majority of production sofas are built for appearance, and only "copy" the world's best designs, using substandard materials with little regard for structure. This usually results in a "swallow you up" effect, and a break down in cushion and frame structure, if sat in repeatedly in the same place. As the sofa breaks down, you work harder to remove yourself. Not only is this type of sofa unattractive - and not a good investment - it is uncomfortable. Properly built sofas will stand the test of time, delivering comfort every time, as well as durability. Artificial leather is a fabric or finish intended to substitute for leather in fields such as upholstery, clothing and fabrics, and other uses where a leather-like finish is required but the actual material is cost-prohibitive or unsuitable. Under the name of artificial leather, (not to be confused with the more modern Pleather) or of American leather cloth, large quantities of a material having, more or less, a leather-like surface were once used, principally for upholstery purposes, such as the covering of chairs, lining the tops of writing desks and tables, and so on. There was considerable diversity in the preparation of such materials. A common variety consists of a web of calico coated with boiled linseed oil mixed with dryers and lampblack or other pigment. Several coats of this mixture were uniformly spread, smoothed and compressed on the cotton surface by passing it between metal rollers, and when the surface was required to possess a glossy enamel-like appearance, it received a finishing coat of copal varnish. A grained morocco surface was given to the material by passing it between suitably embossed rollers. Preparations of this kind have a close affinity to cloth waterproofed with rubber, and to such manufactures as ordinary waxcloth. An artificial leather which was patented and proposed for use as soles for boots, etc., was composed of powdered scraps and cuttings of leather mixed with solution of guttapercha dried and compressed. In place of the guttapercha solution, oxidized linseed oil or dissolved resin could be used as the binding medium for the leather powder. At times made from plastics, are often used in clothing and fabrics. Artificial leather is marketed under many brands, including "leatherette," "faux leather," "patent leather," "Naugahyde" and "pleather". Plastic leather - the term pleather ("plastic leather") is a slang term for synthetic leather made out of plastic. A portmanteau of plastic and leather, the term can be either descriptive or derogatory, depending upon the user. Pleather is often used as an inexpensive substitute for leather (the derogatory meaning implies use as a substitute for genuine animal hide to cut costs). Pleather, being made of plastic, will not decompose as quickly and is not green planet friendly. Not all pleathers are the same. Polyurethane is washable, can be dry-cleaned and allows some air to flow through the garment. PVC pleather in contrast does not "breathe" and is difficult to clean. PVC cannot be dry-cleaned because the cleaning solvents can make the PVC unbearably stiff. Vegan Leather is an artificial alternative to traditional leather. It may be chosen for ethical reasons or as a designed material which may have different properties but a similar look to the natural material. Sometimes referred to as poromerics, poromeric imitation leathers are a group of synthetic 'breathable' leather substitutes made from a plastic coating (usually a polyurethane) on a fibrous base layer (typically a polyester). The term poromeric was coined by DuPont as a derivative of the terms microporous and polymeric. The first poromeric material was DuPont's ill-fated Corfam introduced in 1963 at the Chicago Shoe Show. Newer poromerics include Clarino made by Kuraray Co. of Japan. Corfam was the centerpiece of the DuPont pavilion at the 1964 New York World's Fair in New York City. Its major advantages over natural leather were its durability and its high gloss finish that could be easily cleaned with a damp cloth. Its disadvantages were its stiffness which did not lessen with wearing and its relative lack of breathability. 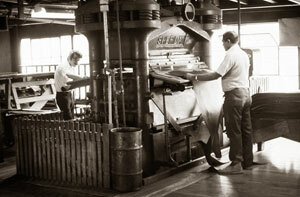 DuPont manufactured Corfam at its plant in Old Hickory, Tennessee, from 1964 to 1971. After spending millions of dollars marketing the product to shoe manufacturers, DuPont withdrew Corfam from the market in 1971 and sold the rights to a company in Poland. Corfam is mainly remembered as a textbook marketing disaster. Corfam is still used today in some products, an example being certain types of equestrian saddle girths. Corfam shoes are still very popular in the military and other uniformed professions where shiny shoes are an asset. Koskin is an artificial leather material commonly found in computer laptop cases. It is commonly used in Hewlett-Packard, Targus and Belkin laptop cases, CD wallets, and other consumer goods. It is made to look and feel like authentic leather. In Swedish, koskinn means cow's skin (ko means cow, skinn means skin), often causing much confusion for consumers. A form of artificial leather, usually made by covering a fabric base with plastic. The fabric can be made of a natural or a synthetic fiber which is then covered with a soft PVC layer. Leatherette bound books and 20th century cameras are good examples of leatherette. Leatherette clothing of various kinds (including lingerie) also exist. A disadvantage of plastic "leatherette" is that it is not porous and does not allow air to pass through it, thus sweat can accumulate if it is used for clothing, car seat coverings, etc. However, one of its primary advantages, especially in cars, is that it requires little maintenance in comparison to leather and does not crack or fade as easily. During a fire, leatherette may cause additional serious skin damage because it not only burns more vigorously than leather, but can also melt. There are many other materials that can be used as leather alternatives. Some of these materials are Vegetan, a shop-owned trade name for one grade of microfiber and Lorica, a wide range of Japanese microfibers including gloss-faced ones, dyed and softened in Italy. There is a type of artificial leather promoted by Sidi, an Italian bicycle shoe maker. Birko-Flor, a proprietary material of Birkenstock, is made of acrylic and polyamide felt fibers; a variation is made to replicate patent leather. Birkibuc, another proprietary material of Birkenstock, is made of the same materials, but designed to replicate the look and feel of nubuck leather. Vinyl, also known as PVC Kydex, is an acrylic-PVC alloy produced by Kleerdex. There are also Cork Leather, made from the bark of Cork Oak trees, and Ocean Leather, a little known versatile leather made from kelp. 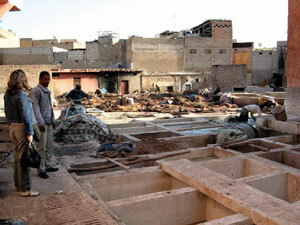 To work in a tannery in Marrakech is to work under some of the harshest working conditions there are. Not only are the workers exposed to the blazing sun, but they are soaked in blood, animal bodily fluids and parts, pigeon poo, and get paid some of the lowest wages on the planet. 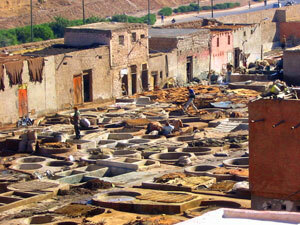 This is one of hundreds of tanneries that work the same around the world. 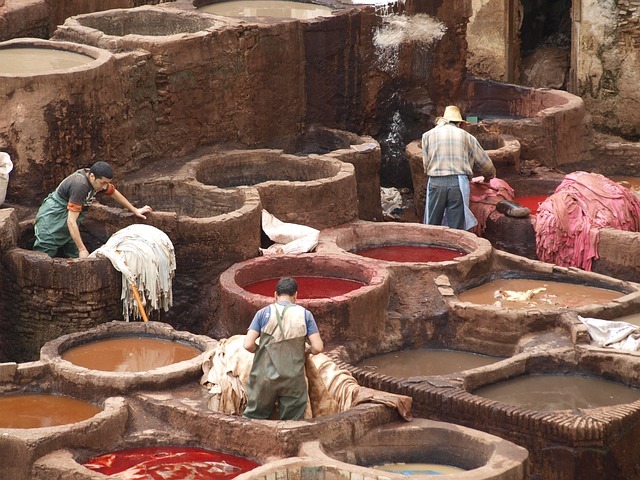 The ancient Moroccan tannery tradition: Legend has it that the tanners are descended from demons who lived under a black king. As they didn't obey his rules, they were condemned to work in the tanneries. 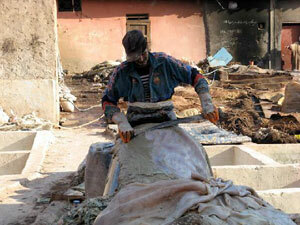 Hundreds of concrete vats are used to process animal skins which are bought locally in the souks. The skins (mainly sheep and goat although camel and cow are sometimes used - lions are no longer used as they were hunted to extinction in the region around 1900) are treated far differently than the way leather is treated in America as the process clings to its ancient traditions. Hair and flesh are removed by soaking the skins in quicklime (Calcium Oxide formed when limestone - calcium carbonate - decomposes) and water. After this, the skins are placed in a vat of water and blood, then separated and rung out, before being coloured using a few natural products: Pomegranate for yellow, olive oil for shininess, bark for various colours, presumably brown, saffron for golden yellow, Henna for red/orange, poppy for many other colors including white, pink, yellow, orange, red and blue. Hides stretched out to dry. The finished product tanned hides look like this. The skins are stretched out and left to dry for over 20 days in little piles that look rancid. Pigeon poo is used to soften the leather. Pigeon poo has actually been reported to be quite dangerous, with people almost dying after ingesting it. The poo adds to the smell of the pits. If you want to be a tanner, you need to be born into it, and only men are allowed. Many suffer from arthritis and are forced into an early retirement. And it has been reported that in Bangladesh, half a million people are at risk of serious health issues due to their tanneries emitting toxic chemicals, such as sulphuric acid, into the rivers. Even in 1866 Americans ran a clean leather processing operation - here are some photos to compare to today's foreign leather tanners. It was in 1866 when Maurice M. Schultz erected the Wilcox Tanning Company in Wilcox between the West Branch of the Clarion River and railroad. The tannery is said to have employed up to 300 men and an additional 400 men to peel bark from the hemlock. 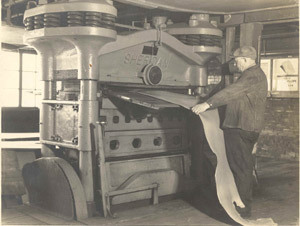 As part of the tanning process, hemlock bark was required in great quantities. The bark contains valuable chemicals, such as tannin, used to tan the hides. The plant had 13 boilers powered by gas wells located at the site. 732 vats, seven (7) feet wide, nine (9) feet long and five and a half (5 1/2) feet deep were encompassed within the facility, making it the largest leather tanning facility in the world. Curing is employed to prevent putrifaction of the protein substance (collagen) from bacterial infection during the time lag that might occur from procuring the hide to when it is processed. Curing removes excess water from the hides and skins using a difference in osmotic pressure. The moisture content of hides and skins gets greatly reduced. In wet-salting, the hides are heavily salted, then pressed into packs for about 30 days. In brine-curing the hides are agitated in a salt water bath for about 16 hours. Generally speaking, methods employed for curing greatly make the chance of bacterial growth unfavorable. 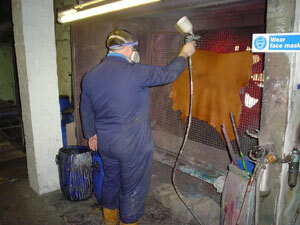 Curing can also be done by preserving the hides and skins at a very low temperature. The hides are then soaked in clean water to remove the salt and mainly to bring back the moisture content to a desirable level so that the hide or skin can be treated with chemicals in an aqueous medium. This process is known as "soaking" and sometimes a hydrating agent is also employed along with water in a very low percentage for hides and skins which have become very dry. The weakening of hair is dependent on the breakdown of the disulfide link of the amino acid called cystine, which is the characteristic of the keratin class of protein like hair and wools. The hydrogen atoms supplied by the sharpening agent reduce the cystine molecule to cystine and the covalent links are ruptured. The isoelectric point of the collagen is also shifted to around 4.7, due to liming which is more towards an acidic tannage. Unhairing agents used during liming are: sodium sulfide, sodium hydroxide, sodium dithionite, arsenic sulfide, calcium hydrosulfide. This machine removes hair from the hide. The majority of hair is then removed using a machine, with any remaining hair being removed by hand using a dull knife, a process known as scudding. Depending on the end use of the leather, hides may be treated with enzymes to soften them in a process called "bating." But before bating, the pH of the collagen is brought down to a lower level so that enzymes might act on it. This process is known as "deliming." Once bating is complete, the hides and skins are treated with a mixture of common salt and sulphuric acid in case a mineral tanning is to be done. This is done to bring down the pH of collagen to a very low level so as to facilitate the penetration of mineral tanning agent into the substance. This Process Is Known As "Pickling"
The common salt penetrates the substance twice as fast as the acid and checks the ill effect of sudden drop of pH. Tanning can be performed with either vegetable or mineral methods. Before tanning, the skins are unhaired, degreased, desalted and soaked in water over a period of 6 hours to 2 days. To prevent damage of the skin by bacterial growth during the soaking period, biocides, such as pentachlorophenol, are used. 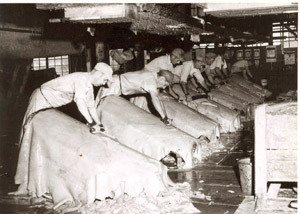 Two men pressing the leather near the end of the tanning process in an American tannery. Vegetable tanning uses tannin (this is where the name tanning comes from). Tannin occurs naturally in bark. The primary barks used in modern times are chestnut, oak, tanoak, hemlock, quebracho, mangrove, wattle and myrobalan. Hides are stretched on frames and immersed for several weeks in vats of increasing concentrations of tannin. 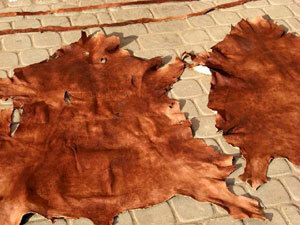 Vegetable tanned hide is flexible and is used for luggage and furniture. Mineral tanning usually uses chromium in the form of basic chromium sulfate. It is employed after pickling. Once the desired level of penetration of chrome into the substance is achieved, the pH of the material is raised again to facilitate the process. This is known as "basification". In the raw state, chrome tanned skins are blue and therefore referred to as "wet blue." Chrome tanning is faster than vegetable tanning (less than a day for this part of the process), and produces a stretchable leather which is excellent for use in handbags and garments. (Encarta, 2003) Depending on the finish desired, the hide may be waxed, rolled, lubricated, injected with oil, split, shaved and, of course, dyed. Suedes, nubucks etc. are finished by raising the nap of the leather by rolling with a rough surface. These are the facts and the photos tell the untold story behind the gloss and glimmer of foreign made leather products in American showrooms everywhere. Many mass production manufacturers have veneered and engineered the core all of the premium lengths of lumber using inferior materials to keep profits up. Always keep in mind that if it is a veneer or "engineered" it usually means that they are using less material and trying to make it seem like more. You should always keep in mind every manufacturer fully understands the quality and life expectancy of their products. The expected result is usually reflected in their limited warranty. This built in obsolescence is intended and most warranties are written in the hopes they will never be read or fully understood until after expiration. Many companies make this statement: using an exotic sounding name along with mahogany, oak, walnut, teak, rose wood etc. to name a few woods used to manufacture our premier selection of solid wood furniture or doors etc. What they really mean is blocks of wood spaced inside and glued together by machine to make a long board, particle board, or an exotic wood, thin veneered surface over particle board. As if using inferior materials were not unconscionable enough, there is more bad news. This cheap cost of product production is not only arrived at because of cheap labor, it also is the result of total disregard for the quality of materials - with little or no guidelines for safety or cleanliness, as well as the ecology of our planet. Not to mention the sub-standard human working conditions in these third world unregulated labor nations. It also means bug infestation certificates are necessary, however getting these certificates is almost never enforced. The result: these imported woods, particle boards, and frames are infected with bug infestations as stated on this government web site. Bug Infestation Information Facts, important details that you should know before you purchase woods, particle boards, and frame imports - Florida Entomologist 89(1) Report. ArtFactory.com Is The Right Choice.